The Bottom Line: As an avid skier and one who has always worn five-fingered gloves, Outdoor Research Highcamp 3-Finger Gloves keep my hands warmer than traditional leather racing gloves. 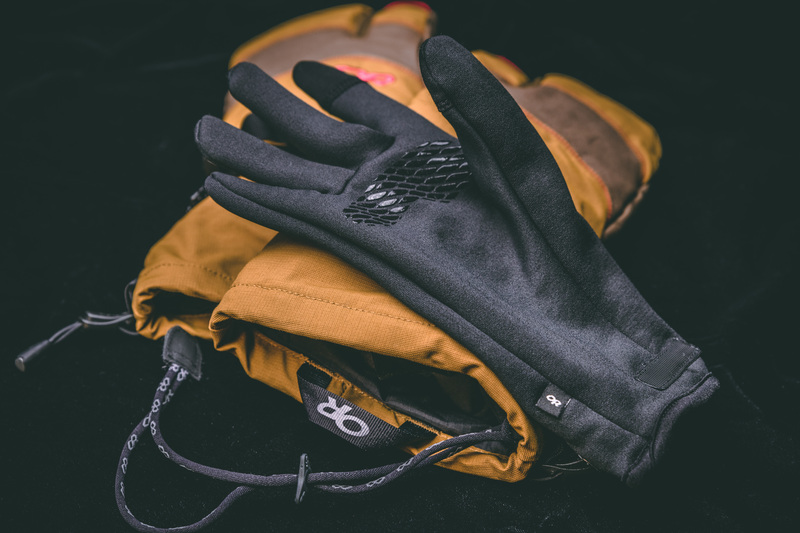 With a use for every sport—alpine or backcountry skiing, winter fat biking, snowshoeing, or other cold weather activities—I came away from this review asking myself, “Why have I never tried mittens before?" OR Highcamp 3-Finger Gloves have internal liners that can be removed on warmer days. John LaGuardia. My overall experience with the Highcamp 3-Finger Gloves was a good one. I put this product to the test on eight alpine ski days and three backcountry ski outings. The gloves retail with a removable, five-fingered inner liner, which adds dexterity to the glove. The liner is also touchscreen compatible. I found that, if they fit a bit loose, they are more difficult to use with a smartphone. I tested a size medium for this review. On the outside, the Highcamp 3-Finger Glove fabric is waterproof with a water-resistant leather palm. The leather feels oh-so-soft and adds to the positive experience by being super comfortable. During powder runs, the SuperCinch Gauntlet™ kept the snow out and the warmth in. The included leash is a nice touch, but it could be improved with an elastic wristband instead of a manual cinch. Pro tip: Cinch the leash around your wrist one-handed by sliding your hand through the strap, reaching downward with your index and middle fingers, then slide the cinch fabric toward your wrist. This will help you put the leash on quicker and will ensure that you don't lose the gloves when you are on the ski lift. Its packaging is also notable for being recyclable and easy to take apart. Overall, the gloves have a comfortable yet bomber construction. Leather palms grip ski poles like a champ. Unfortunately, they are available in only two colors, and I would love to see these produced in gray with a white leather palm. The Highcamp 3-Finger Gloves offer plush and warm insulation for those whose hands get cold easily. Head on over to the Outdoor Research site and check 'em out. Outdoor Research did not provide equipment or associated materials for this review. All photos are courtesy of LaGuardia Adventure Photography.